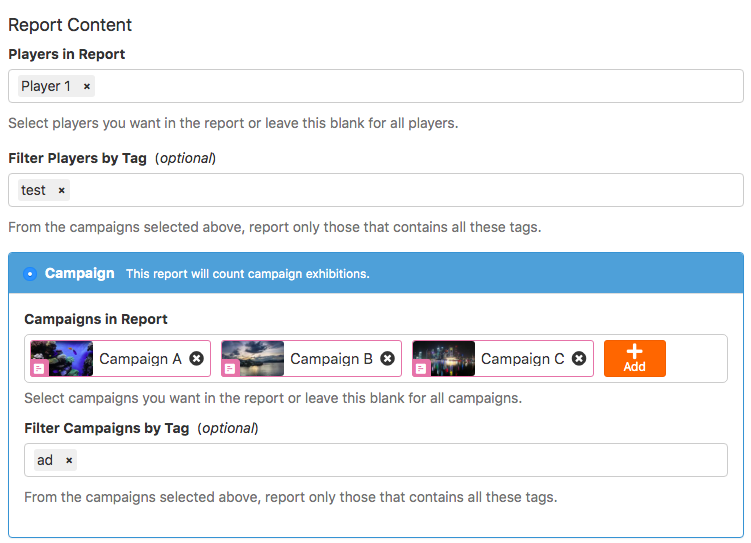 Automate Report and conveniently keep track of Campaign playback. If you wish to keep track of a specific content or a collection of Campaigns, you can schedule Reports to be generated. 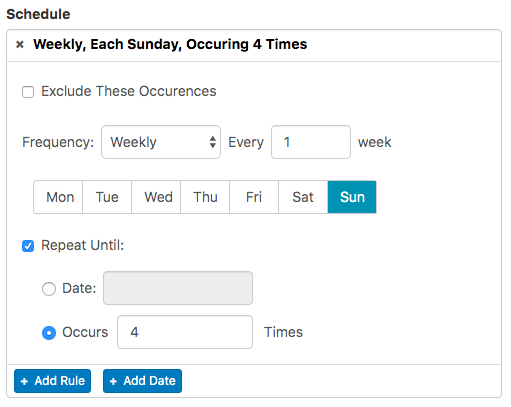 You can set rules to get the data periodically, and even send them automatically by email to other shared users and clients. In your OnSign TV account, click on your username on the bottom-left corner and select “Reports”. 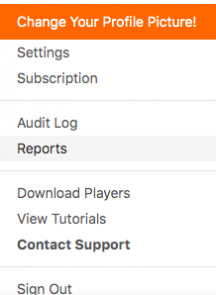 You can either get a single Report instantly or schedule Reports to be created when you want them to. If you wish to generate a single Report, you are already on the right page. Simply click on the top-right and select “New Report”. If you want to schedule a Report, change to the tab on the top to the one that says “Schedule Report” and then click on the top-right to create a "New Report". When you only need one single Report, you decide for which period of time you need it. Click on the “Add Date” button to generate a single Report on a specific day. Hit “Add Rule” if you wish to generate Reports with the same parameters with a regular frequency. Select the period covered by the Report. You can gather Campaign playback data of previous days, weeks or even months. Below the schedule fill out the period offset in case you want the Report to end prior to the day when it is going to be generated. Example: You generate the Report on the 5th of each month, but you want to cover the previous month. Then, set 5 as offset so the beginning of the current month won’t be included in this Report. Select the Players from which you wish to collect the data. In case you wish to track content from the entire signage network, leave it blank. Select the Campaigns whose playback you wish to analyze. Leave this blank as well if you wnat to get an overview of every content jointly. At last, at "Report Options" you define the output format (HTML, PDF or Excel spreadsheet) and determine who will receive notification by email to download the file. The email doesn’t need to be associated with your OnSign TV account. Set as many notification emails as you wish. Finish by clicking “Create Report” on the bottom. View all scheduled Reports in the tab "Schedule reports". Once the first Report is generated, the button "View Reports" will replace the button "Scheduled" on the side (see image below). As you click, you will be redirected to the Reports. You can also check out all Report files by going to the "Content" page and selecting the "Saved Reports" folder.